The plague of tuberculosis, usually called TB, is all but forgotten, thanks to modern antibiotics. As recently as the early 20th century, it was the leading cause of death for those between the ages of 15 and 45. There was no effective treatment for TB until the mid 1900s. Today TB, nearly forgotten by most, still affects especially those who have inadequate food, sanitation, and shelter. Although there are several kinds of TB, the most commonly thought of is pulmonary tuberculosis, originally called consumption, which afflicts the lungs, limiting the ability to breathe. In addition to a general debility, consumption’s most obvious symptoms were coughing and hemorrhaging. Consumption was reported to be the leading cause of death in the 18th and 19th Centuries, at times reaching epidemic levels. It was known as the white plague – in contrast to the black plague. The disease was so much a part of daily life, that it was prominently featured in an opera, Puccini’s La Boheme, whose heroine Mimi ultimately died of lung hemorrhage. TB was known to be highly contagious, but the only way to prevent spread of the disease was to isolate those with active infections. Hence the need for sanitariums – usually just shortened to “sans” — to confine those with active TB. San residents were permitted only limited contact with others, especially children. Although many died in sans – in Rock Island, there were twenty such deaths in 1937 – others were released, usually after a stay of two or three years. Patients were not cured. The nature of TB is that once the body is infected with the bacillus, it remains infected, even though the disease could become inactive. The inactivity of the bacillus meant patients were non-contagious and could be released from the San. In the first half of this century, most Illinois counties began to operate a TB San. This postcard, dating from 1935, shows the san built by Rock Island County in 1931. It was designed by the prominent local firm of Cervin & Stuhr to replace a circa 1917 San that had been on the southeast corner of 17th Street and 25th Avenue. This new San was built a block to the east at 2122 25th Avenue. It was able to house at least 79 patients, in contrast to only 20 at the previous building. Cervin & Stuhr’s red brick building did not look institutional at all. Although it was a restrained design, it was enhanced with details typical of the era. In many ways, it showed similarities to the Fort Armstrong Hotel, which had been built in 1924. Each corner had a zipper of white stonework quoins providing a strong vertical outline. There were three horizontal bands of white stonework as well. The parapet wall had a balcony effect on the elevator tower and above the main entrance. The many closely spaced windows on either end of the building opened onto sun porches, a holdover from the early days of sanitariums, when treatment called for patients to spend most of their time on screened porches regardless of cold or heat. The new building held wards for residents as well as semi-private rooms. Men were housed on the first floor, women on the second and children were on the third floor. Most older folks will remember the annual Christmas Seal campaigns, a national TB fundraiser for decades. During the years when TB was an active threat, Christmas Seals helped fund many programs to diagnose and treat the disease. Local efforts were based at the county san. 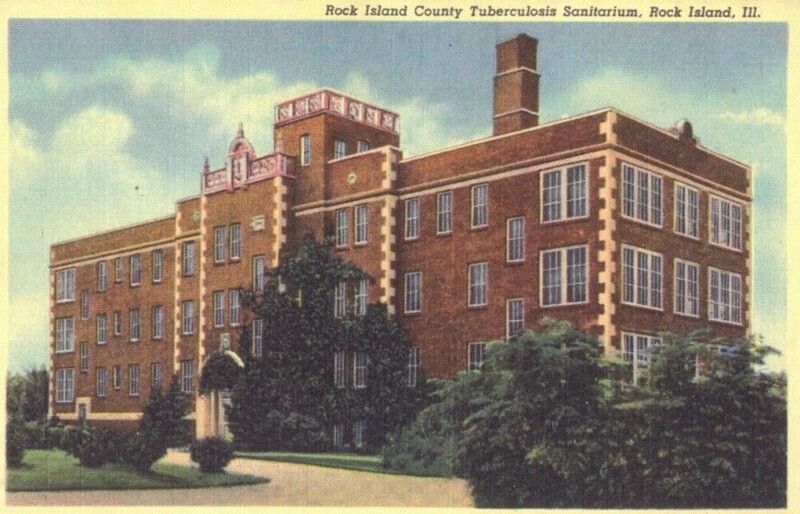 Rock Island County’s san operated until 1974, when it was no longer needed, because new antibiotics allowed TB to be treated on an outpatient basis. The san was converted to the County Health Care Center, a skilled nursing facility, with a TB clinic maintained in the basement area. The nursing home was closed in 1995. The old san was torn down in 1999, with those who inspected it at the time agreeing its condition was very poor, despite its still attractive outward appearance. Although TB sans were common fifty years ago, virtually all have either been demolished or converted to nursing homes. The fact that sans are no longer needed for their original purpose should cause us to rejoice. But we need to remember that buildings are sometimes very important for the history they represent, not just for their architectural design. Rock Island County has only memories of this piece of our history, of the way we dealt with a modern plague; nothing tangible is left. The site is now just a parking lot. This article by Diane Oestreich is slightly modified from the original, which appeared in the Rock Island Argus and Moline Dispatch on September 15, 2002.